Each year companies spend millions of dollars on Super Bowl ads just to get our attention for 30 seconds. Some we remember, some we don’t. One of our favorite campaigns so far in 2018 is Squarespace’s new ads featuring Keanu Reeves. This marks the fifth consecutive Super Bowl campaign for the company, which has put a lot of money into advertising on Podcasts and other millennial-based platforms over the past few years. 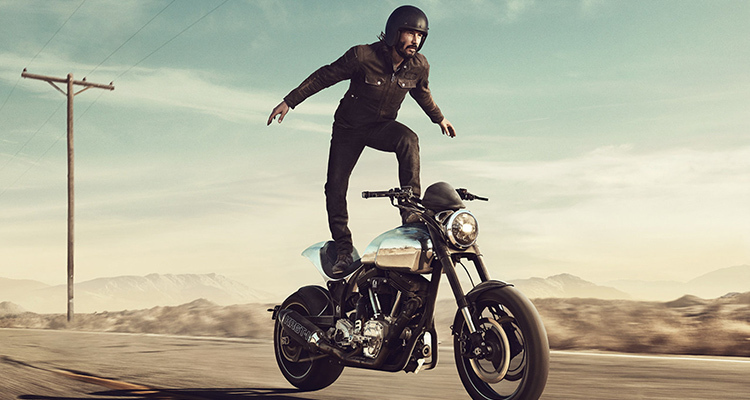 The in-game commercial features Keanu Reeves, a Squarespace customer and the co-founder of Arch Motorcycle, surfing atop one of his own bikes. While riding the motorcycle, Reeves encourages audiences to take the same metaphorical leap to pursue their passions and follow their dreams. The 30-second spot will run during the big game as part of a larger brand campaign with Reeves, which includes two additional films intended to inspire viewers to take the first step in pursuing their passions by making a website on Squarespace. Six years ago, with his co-founder Gard Hollinger and the rest of the Arch team, Reeves launched the American-made motorcycle company inspired by his passion for motorcycles. Arch chose Squarespace to launch their project into the world because of the companies’ shared emphasis on powerful design. Reeves, heavily involved in the creation of his bikes, also takes a hands-on approach managing the Arch Motorcycle website on Squarespace. This isn’t the only ad with Keanu Reeves, you can find them all on the company’s YouTube channel, and they are all pretty terrific. This one, with Keanu sitting by a campfire, is my favorite so far.